Reading through these common business plan mistakes before you write one will make the task a lot easier – and give your new business venture a much better chance of success. Not bothering to write one. This is far and away the most common error. Entrepreneurs are doers so it's natural that they want to get on with things and get them done – especially when they have an idea that they’re excited about buzzing around in their heads. But who hasn’t heard the adage "He who fails to plan plans to fail?" And that's the fate of almost every business someone starts without a business plan; failure. So yes, you need to write a business plan. You don't necessarily need a full-scale formal version of a business plan professionally packaged in a binder (see the next point about purpose), but you do need to have one. Not being clear about the purpose of your business plan. A business plan is essentially a solution to a problem, the problem being how you are going to turn your vision of a successful business into a reality. So why are you preparing a business plan? Is it to persuade a potential lender to give you a business loan? Attract investors? Figure out if your new business idea could actually be turned into a viable business? Serve as a blueprint for your successful startup? The purpose of your business plan will affect everything from the amount of research you have to go through what the form of the finished plan will look like. If all you want to do is find out if a business idea is a good one that might be worth working up a business plan about, use these five questions to tell if your business plan idea is worth it. Not having a clear business model. A successful business has to make a profit. It's astonishing how many people who start small businesses don't seem to grasp this basic fact or are incredibly skilled at ignoring it. Planning to sell something is not a business model; a business model is a plan for generating revenue over and above your expenses. You can make the best mousetrap in the world, but if it costs you $90 to make each one and people are only willing to pay $10 for one, there’s no point to doing it as a business. By all means, if it provides you with personal satisfaction and you feel the cost is fair, do it. Otherwise, forget about it and move on to a business idea that does have profit potential. Professional and service businesses can be real dead-end traps if you don't have a clear business model set up. Not doing enough research to do the job is another common business plan mistake. Your business plan is only going to be as good as the research you put into it. To answer the central question of "Will this work?" you have to find the answers to a whole cluster of other questions, from "What are the current trends in this industry?" to "How will this business counter what its competitors are doing?" And the more complete the answers to the questions, the better prepared you'll be to either start your new business or shelve the idea and move on. Every section of the business plan will need research except for the Executive Summary. Fortunately, a lot of the required research can be done online, but there’s no getting around the fact that writing a business plan is a lot of work. You and what you want to do are only one half of the equation of starting a successful business. The market is the other. You can have the best product or service in the entire world for sale but it doesn't matter if no one is willing to buy it. That is one bedrock, non-negotiable market reality. So it's crucial that you market test your product or service before you try to base a business on selling it. If you want to sell products, try selling them at local venues, such as farmers’ or flea markets and local trade shows, selling small batches online through eBay or Etsy, using focus groups to gauge interest, or giving out free samples and gathering people's feedback about them. If you want to sell services, surveys of potential interest or focus groups can work well. Do-It-Yourself Market Research explains how you can do your own market research, including tips for designing surveys and questionnaires. The competition is another market reality that has to be adequately dealt with in your business plan. It's not enough to just point out who they are; you need to examine what the competition is doing and explain specifically how you’re going to counter what they're doing to win market share. You have to make sure you take into account all the competition. Don't just think of those competitors operating exactly the same kind of businesses; think laterally, too, to be sure you identify all competitors. For instance, a prospective flower shop is not just competing against other flower shops in a particular area; it’s also competing with all the other local businesses that sell flowers, including grocery stores and big-box retailers and online flower sellers. That doesn't mean you have to list every potential competitor in your business plan and explain how you’re going to win the contest with them, but you do have to list and explain how you’re going to deal with the potential threat of each type of competition at least. Not doing a thorough preparation of financials. To do this, you need to figure out how much money you need to start and operate your business and make educated guesses about how much money your new business will bring during its first year of operation. There are two common mistakes people make when they're tackling this section of the business plan. The first is not being realistic about their expenses. People often leave out expenses entirely or underestimate the cost of particular expenses. Meticulous research will prevent this mistake. The second is being overly optimistic about your new business's prospects. You're hoping your new business will do well. You wouldn't choose to start it otherwise, but you mustn't let your optimism lead you to create overly rosy cash flow projections. Setting your business plan aside after you've written it. If you write a business plan, use it to get a loan and never look at it again, you're wasting most of its value. A business plan is just that; a plan for how your new business is going to succeed. Treat it as your new business's first planning document and as you move through the startup period and beyond, edit and add to it as necessary. A pair of good first additions to your business plan is the Vision Statement and the Mission Statement; creating these will solidify your goals and make sure you don't get sidetracked. Your original business plan will also be a useful reference document when you’re doing the ongoing business planning running a successful business requires. For instance, see Quick-Start Planning for Small Businesses for instructions on how to create an action plan for your small business. When you're writing a business plan, the answer to the central question, "Will this work?" is not always positive. And that's fine. It means the business plan is doing its job of showing you whether or not a business idea is worth doing and saving you potentially huge amounts of money and time. Usually, this discovery occurs during the course of working through a business plan, not at the end. And that's the time to quit developing that particular plan. 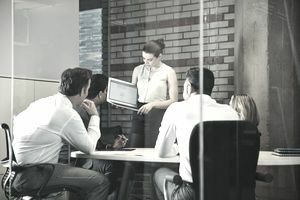 If you discover, for instance, that the market for your proposed product is saturated while you're working on the Competitive Analysis section of the business plan, there's no point in carrying on and going to the trouble of preparing financials – your time is much better spent coming up with another business idea that may be more workable. Perseverance and determination are great traits for entrepreneurs to possess – until they turn into foolish persistence and keep you from accomplishing what you could be accomplishing. That can be the worst business plan mistake of all.